Crestridge Dental offers implant dentistry services to their patients in the Burnsville, MN area. This is a surgical procedure where a screw is placed in the gums where the root of the tooth would be. This will help increase the confidence of those who have lost teeth and do not want to consider dentures. Implants are more permanent and cannot be removed like dentures can be. X-rays will be used to determine where to place the implants. A consultation with your dentist or oral surgeon will be needed to determine each step of this procedure. You may also need mini-implants or grafting if your jawbone or gums are not in their optimal health. They will discuss options for anesthesia, surgery, after-care, and more. 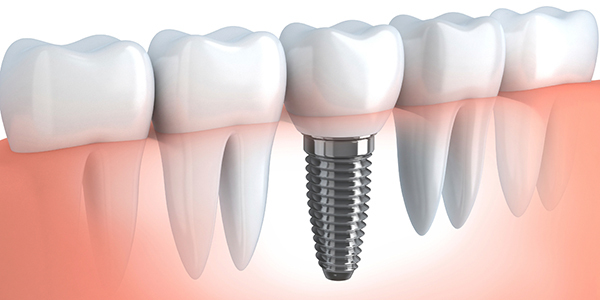 Dental implants allow you to have a more natural and comfortable smile. Missing teeth can cause discomfort and allow significant changes to your bite. Don’t let that happen to you. We can help! This can be a tricky procedure, and communicating with your dentist and oral surgeon is very important. If you think this is something you need or are interested in, please give us a call to set up your initial consultation. For more information on dental implants, please visit: http://www.mouthhealthy.org/en/az-topics/i/Implants.